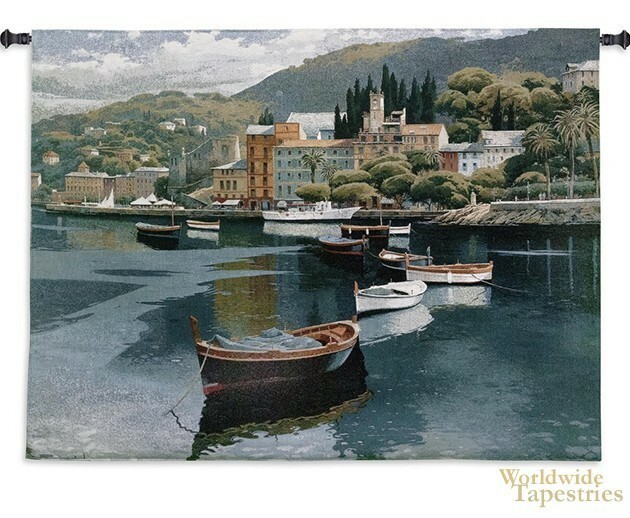 This tapestry "Before The Rain" shows a beautiful Mediterranean portside scene by artist Ramon Pujol. With a wonderful composition of boats in the harbor and the gorgeous Mediterranean village behind, and a masterful use of color, this work has the hallmarks of the works of Pujol. His love of the Tuscan and Mediterranean region and seaside harbors is reflected here in this piece and here, the scene that is depicted is the scene just before the rain. The reflections on the water and the overcast color palette which is a muted version of the bolder and bright palettes of his other works in sunny scenes, shows the delicate, subtle gradations of light and color in the moments before rain. This Tuscan landscape tapestry "Before The Rain" is backed with a lining and has a tunnel for easy hanging. Note: tapestry rod and tassels, where pictured, are purchased separately. Dimensions: W 53" x H 38"